Downtown Saint Paul parking garages fill up fast when there's a big event. With ParkMobile, you can reserve garage parking ahead of time! See garage availability near you, compare rates, and reserve parking across Saint Paul! Get the app for iOS or Android. 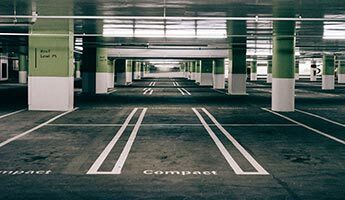 Ready to Reserve Garage Parking in Saint Paul? Awesome! You're ready to park smarter. Book garage parking in Saint Paul online, right this second. You'll be able to skip over full garages and only view ones with available spaces, reserve Saint Paul garage parking ahead of time, and submit your payment. Book through the ParkMobile app instead to get added benefits, like warning messages before your parking session expires. That means if the concert runs over, your shopping trip turns into drinks with friends, or you want to stay out, you can! Just extend your garage parking reservation and forget about tow trucks or parking tickets, or running back to the parking garage to put money in some confusing kiosk. ParkMobile's pay by phone parking app and alerts mean parking worries never have to put an end to a great time again. You can plan ahead and reserve your garage space months ahead of time, or fly by the seat of your pants and use the ParkMobile app in-the-moment. No matter where you're headed, ParkMobile can make the parking part easy-peasy. Saint Paul is such a unique city. You deserve to enjoy everything it has to offer! Let ParkMobile guide you in the ways of downtown Saint Paul parking. We can hook you up with affordable and fast garage parking near all of the big Saint Paul attractions, including museums, baseball fields, airports, auditoriums, colleges and universities, and more! There are so many empty parking spots in parking garages across Saint Paul, waiting just for you! Once you reserve garage parking with ParkMobile, your space is guaranteed reserved, so you won't have to drive around the block looking for parking again. Your next trip to the big city can be an easy one. Use the ParkMobile app or go online to save time and money on Saint Paul garage parking reservations. What are you waiting for? Get parked and get a running start wherever you're headed – opera, museum, courthouse, festival, big game, or brunch with friends and family. Reserve hourly parking in a Saint Paul parking garage near you today!